Three hiking days in South-Tyrol and the Dolomites, plus two days of cycling as we follow the Etsch River (or Adige River, as it’s called in Italy) on a gentle, predominately downhill ride, always with the majestic peaks of the Alps and Dolomites as your backdrop. Explore South Tyrol as you hike and bike your way through the Italian Alps, following the gentle path of the Adige River as you take in Northern Italy’s renowned Dolomites. Discover enchanting villages and fertile countryside in this UNESCO world heritage site. 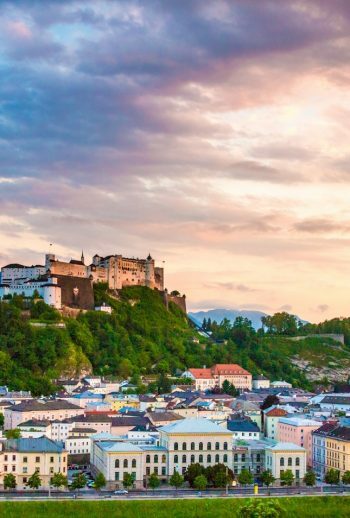 Recognized for its sheer beauty of deep valleys and high vertical walls this dramatic karst landscape will keep your jaw dropped and feeling awe inspired throughout this six-day, best-in-class travel experience through South Tyrol. The perfect balance of relaxation and adventure awaits! Church of St. Procolo: known as a “place of energy,” located amidst apple trees, this small church features beautiful, unorthodox paintings on its sacred walls. Trauttmansdorff Castle: this enchanting palace displays a spectacular garden with plants from every corner of the globe nestled below in a dramatic twelve-hectare amphitheatre. The mountain men: some of history's greatest climbers, skiers and mountaineers hail from Northern Italy and many come from afar to tackle the challenging terrain of these stunning peaks. We meet in Verona in the morning and begin the day with a transfer to Katharinaberg. Our hiking trail leads us through the nature preserve Texelgruppe, offering fine views high above the Schnalstal valley. For lunch, we will stop at one of the pretty mountain farms which offers home-made delicacies. We then start the descent to Naturns, a lively town down in the valley. Once in Burgeis, check out the beautiful 12th century Romanesque frescoes at the Marienberg Monastery Crypt. This evening we’ll gather for a grand welcome dinner with South-Tyrolean specialties in the restaurant of our hotel. Hotel Mohren & Plavina is a traditional country inn in the center of the idyllic village of Burgeis. Relax in the wellness room, by the indoor pool or on an outdoor sunbathing area. Enjoy a morning of breezy down-hills, reminding yourself to slow down and take in the jaw-dropping panoramas that unfold around you. Snap photos of the Parochial church perched just outside the walls of the small fortified village of Glurns. Break in Latsch for a nice group lunch. Visit the San Procolo church in Naturns, home to magnificent eighth-century frescos, the oldest in the German-speaking world. Stroll the white-marble village of Laas and immerse yourself in a world of miniature trains in Rabland. The day culminates in the aristocratic spa town of Merano, famous for its picturesque promenades, towering cathedrals and lush gardens. A gourmet meal will be served tonight at Hotel Meranerhof’s restaurant. Situated on the Passer River in the heart of Merano, the family-operated Hotel Meranerhof has been offering tastefully furnished rooms and a personal, friendly atmosphere for over 40 years. Today we trade our cycling shoes for walking boots beginning with the Tappeiner promenade winding high above Merano, followed by the Meraner Höhenweg (reached by cable car), on our way to Dorf Tirol, a charming town dominated by its 12th century castle. In the afternoon, explore the magnificent Trauttmansdorff castle and award-winning gardens in the outskirts of Merano. If you prefer to pedal, opt to follow a peaceful bike path through the Passeiertal Valley. In Sankt Leonard, a charming hilltop Tyrolean village, visit the folk art Passeier Museum, where you can enjoy an exhibit on the Tyrolean freedom fighter Andreas Hofer and explore old farmsteads typical of the region. The evening is yours to discover Merano on your own. A short day in the saddle today leaves ample time to explore the surrounding sites, including Sigmundskron Castle and the MMM Firmian Museum founded by mountaineer Reinhold Messner. In the lively town of Bolzano, we’ll visit the Museum of Archaeology, where the famous Ötzi is on display; this well-preserved mummified corpse was found in 1991, after spending 5300 years frozen in Alpine ice! Marvel at the pink sandstone and multicolored roof tiles of the village Duomo (cathedral). Check in to the ParkHotel Laurin, your home for the night, before enjoying an exotic dinner made of locally-grown ingredients. Built in 1910 and restored with great love for detail, the four-star ParkHotel Laurin in the heart of Bolzano offers modern comfort and service with an original Art Nouveau ambience. This morning we transfer into the Dolomites to St-Ulrich, where we take the cable car to 6000 ft. The Alpe di Siusi (Seiser Alm), is a large highland plateau, where the green meadows offer refuge to hundreds of grazing cows, surrounded by 10,000 ft mountains such as the Langkofel and Plattkofel. An easy 3.5 hour loop hike takes us from mountain hut to mountain hut through some of the prettiest and dramatic landscape. A charming restaurant will host you tonight as everyone gathers together for one last group dinner. After breakfast, a scenic transfer takes you to Verona where you will be dropped off wherever you please – at your hotel, the airport or the train station. If you have time in Verona, be sure to visit Juliet’s Tomb in the Capuchin cloisters, adjoining the little church in which Romeo and Juliet were married. Prior to the trip, arrive at your own convenience in Verona. On Day 1, we will meet you in the lobby of the Grand Hotel in Verona at 8:30 a.m. A two hour transfer leaves us in Katharinaberg, where the hiking begins. After breakfast on Day 6, we take you to the airport, train station, or the hotel of your choice in Verona (1.5 hour transfer). Just south of Austria lays sun-drenched South-Tyrol, a region of breathtaking beauty bordered by the Dolomite Mountains. The mountain landscape is dotted with fortified towns and opulent villas set amid robust vineyards, apple orchards and lush green pastures. Marvel at the well- preserved mummified remains of Ötzi, a 5,000-year-old Neolithic huntsman found beneath the ice of a glacier and preserved in a special refrigerated cell in the archaeological museum in Bolzano. Enjoy savory Austrian/Italian cuisine and luxuriate in one of Mother Nature’s most pleasurable playgrounds. All activities, ferry crossings, etc. Austin AdventuresT-shirt, water bottle, luggage tags and luggage service.